Having fresh food and cool drinks is a must for any long distance traveler. Though there are plenty of excellent ice chests available, sometimes you just want the reliability of an electric cooler. You don't have to worry about melting ice or leaks with a plugged in cooler after all. In this article, I'm going to break down the five best electric coolers offered online. There are plenty of options for those who want to be plugged in. I consider design, spaciousness, noise level, and all the important features to better help you make the right decision when it comes to electric coolers. Looking for a heavy duty ice chest to go along with your electric? We put together top of the line reviews with extensive meta-data research on all the best coolers right ﻿here. 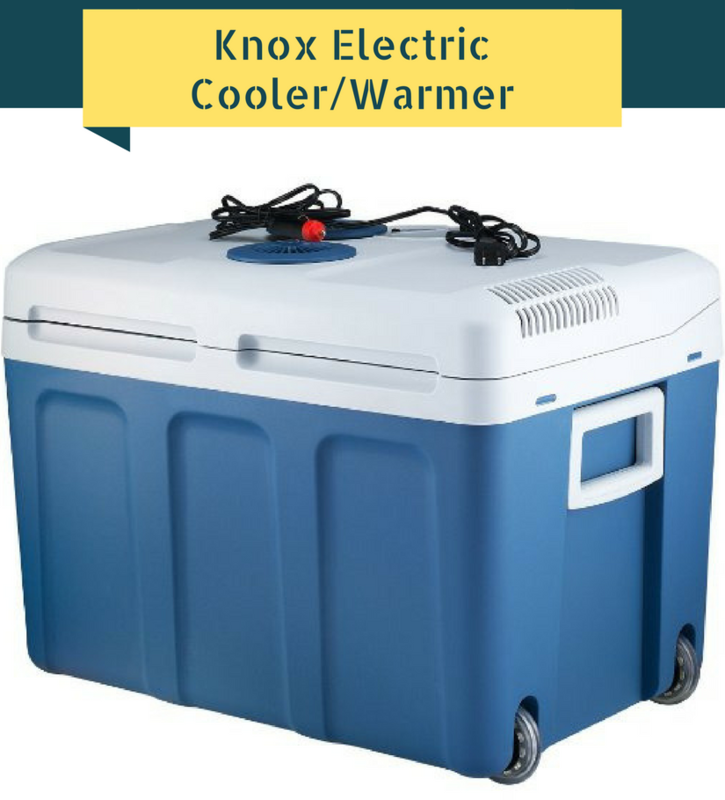 My top electric cooler pick is the K﻿﻿nox ﻿﻿48 Quar﻿﻿t Electric Cooler/Warmer. As you can guess from the name, this is a versatile piece of gear with options for cooling or heating food when on the road. The built-in AC home plug and DC car plug also means you have plenty of options for charging this spacious cooler. At a mid-range price, this chest is an excellent deal for the 48-quart size. Keep in mind the fan is rather noisy, so sleeping with it running could prove difficult. The wheels make it an easy companion to carry around with you, while the five and half foot DC cable is a convenient length for plopping it on the backseat. One of the best 12v coolers on the market is the W﻿agan 12V at a price that is a steal of a deal. The Wagan 12V Cooler/Warmer may be small, but its great design means it has a surprisingly spacious interior. Its petite size allows it to sit comfortably behind the passenger seat which of course makes the Wagan very portable. The fan is not too loud, though you will notice it somewhat in a totally quiet room. The seven and half foot DC cable is long enough to sit it on the backseat of larger cars, so any younger campers behind you can help themselves to chilled snacks on the way. My most affordable option on my best electric coolers list is the Excelvan travel refrigerator. This is a convenient little cooler with a few nice attributes for its cheaper price. The top cover offers easy access to the chamber, while the shoulder strap means you can carry this cooler from home to car and car to site without any trouble. The slim body design lets this chest sit easily on the floor of the backseat, and the non-slip footpads are a nice safety feature. The cooler does have a strong plastic smell straight out of the box, so it's advisable to wrap food well or air the machine before use. However, if you are looking to save money and want a great electric cooler for your next adventure, we think the Excelvn portable cooler/warmer might be just what you were looking for. It will be no surprise to outdoor enthusiasts that an Igloo model has made it onto my list of electric cooler reviews. This is a top brand that comes with a high price tag. However, as often is the case, the high price point means better quality. 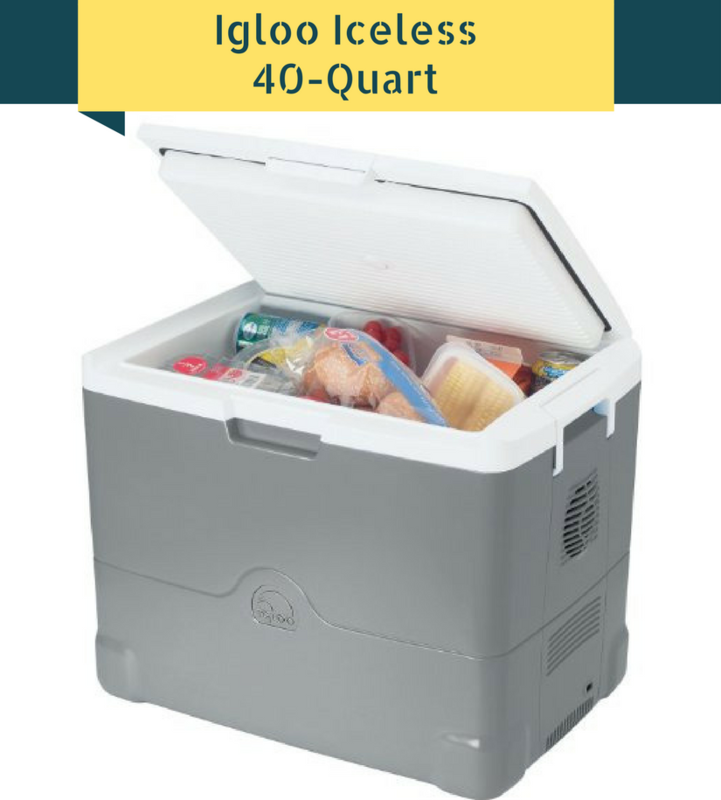 The Igloo 40-Quart is plenty large enough to carry a good amount of food and drinks for your next car ride. The aesthetic exterior is sleek and modern, and the body is well-constructed and durable. Dual orientation means that this electric chest is top-loaded when horizontal, or front loaded with a door when it's vertical. The power cord can be a little fragile, so take care when plugging the cooler in and removing the plug after use. If you are looking for a nice sized popular name brand cooler, look no further than this Igloo model. Check the price below. Last on my list is the Coleman 40 Quart PowerChill Thermoelectric Cooler. This car cooler is a sound buy, and can be used in the home as well with its 110v outlet, but you will definitely need an adaptor. Also, dual oriented, this is a well-thought out product with tray shelves for organizing your items. This means you can easily fit in more essentials than less well-outfitted coolers. The motor is quiet, so if you are using this in sleeping areas such as an SUV or a dorm room, then you shouldn't lose any sleep. Pre-chilling items before putting them in will make the best use of this solid cooler. Conclusion: Which Cooler Is Right For You? I've looked at some of the best electric coolers available online. Personally, we really liked the Knox 48 Quart Cooler/Warmer due to its large size, versatility, and durability. But other brands like the Igloo 40-Quart Po﻿werChill offer a great alternative if you are looking for something different. While powerless ice-chests are a more independent, rugged option, electric coolers have plenty of benefits, and can serve multiple purposes such as an extra refrigerator in the kitchen, a dorm or in the garage. If you are going on long road trips this saves the hassle of having to constantly be buying more ice and draining out the water on a regular cooler. When considering your options, it's best to think about where you'll be using the cooler. If it's in sleeping quarters, you'll want something with a quiet fan. However, if it's for long car journeys the fan noise won't create as much of a problem. Cord length, the cooler's interior, and durability are also factors that must be considered before you make that all-important purchase. Not satisfied with the electric cooler options and want a real heavy duty cooler? We put together a list of the top ﻿heavy ﻿duty coolers on the market. Check out our in depth analysis and review of the be﻿﻿s﻿﻿t coolers on the mark﻿﻿et here.